OnePlus has been known to launch just 1 Smartphone at a time that’s bundled with an amazing software experience along with a pricing that does not drop frequently. 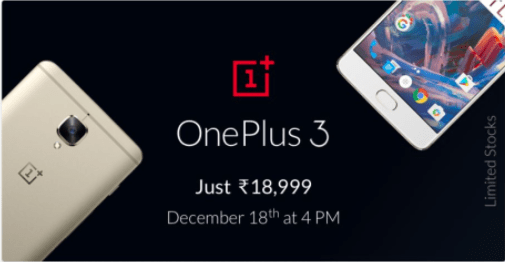 But today surprisingly when the OnePlus 3T their latest offering went on sale, Flipkart announced that they are going to offer the OnePlus 3 Smartphone at a price of Rs 1_,999 which clearly hints that the phone would be available at less than Rs 20,000 price. The twist here is that Flipkart has never been the sales partner of OnePlus & still they have gone ahead & listed this kind of offering. This is the exact question that Carl Pei, co-founder of OnePlus had asked Sachin Bansal who is the co-founder of Flipkart. The e-commerce site is going to host a “Big Shopping Days” sale with numerous offers while the highlighted offer as shown clearly below is from OnePlus. If you recall, the OnePlus brand has been working with Amazon for their debut in India & have been sharing great experiences through this tie-up. Earlier the phones were available through the Invite System and now available under open sale, though Flipkart was never a part of these offerings. To investigate on this, we went ahead to find out the Import cost of the OnePlus 3 Smartphones that came out to be around Rs 22,744 along with which additional sales tax would be added. It is clear here that the phones are Imported at a price above Rs 20,000 & Flipkart is either offering new phones under a loss to create a hype on the well-known brand’s offering or else they are probably procuring refurbished units and going to provide to their customers. In fact, the refurbished OnePlus 3 are also listed only on Amazon India at a price of Rs 24,349 while the brand new device cost Rs 27,999 in India. Some time back we had covered a story about Amazon offering refurbished phones in India that are certified and worth taking a look but currently what Flipkart is going to offer is a suspense. Followed is a quote from Wikipedia. In December 2014, the One was released in India exclusively through Amazon; invites were still necessary to purchase the device outside of special promotions, which have been held occasionally since its launch. With no information available, it’s quite possible that they are probably going to offer brand new devices which are what they should, but the question is how. Without any tie-up, how are they going to get the stocks for their customers? If not let us guess that this is just another marketing activity that would have been offered with just a few units in return for a huge buzz on the Social Media? Time shall tell while we wait for an answer from Sachin Bansal who has been tweeted by Carl Pei. OnePlus is focused on creating premium flagship smartphones. We have an exclusive partnership with Amazon in India. We advise customers to purchase OnePlus products only through official channels as we cannot guarantee the authenticity of the products sold elsewhere. 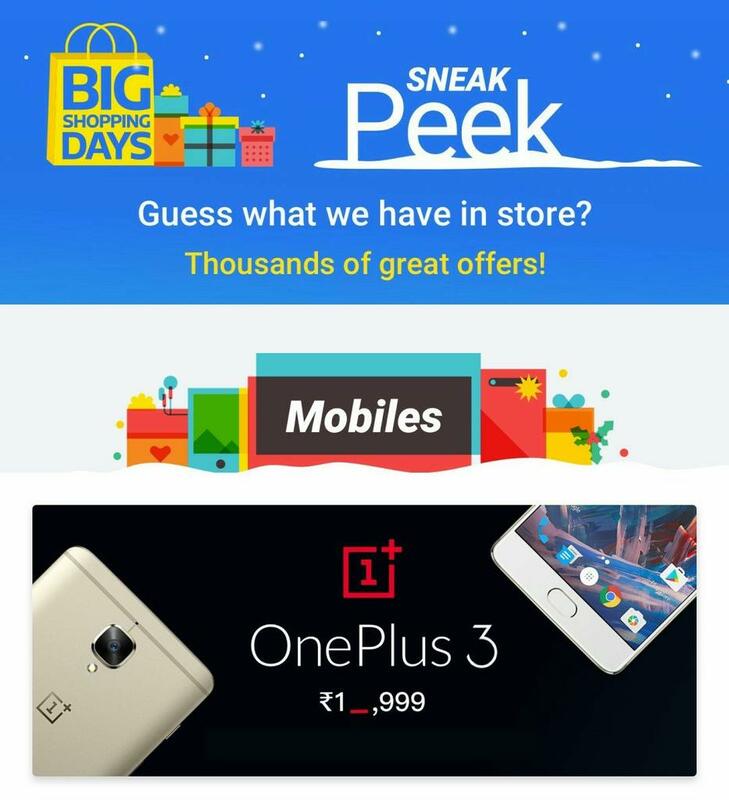 Update 2: Flipkart’s Big Shopping Day has started and they have listed the OnePlus 3 Smartphone at a price of Rs 18,999 which is far lower than the official pricing. The product would be available for purchase on December 18th at 4pm according to the banner. Also, there is no information on the product ie brand new, refurbished or under exchange but we can guess they are probably referring to new products.